Why did you choose Integrale Homes as your preferred home builder? They had the exact house plan that we were looking for that fit our budget. We saw numerous display homes and were really impressed with the quality. How did you find your experience with your sales consultant? The process was very simple and hassle free, getting us all the information we required before making the final decision. How did you find your colour selection experience? Amazing! 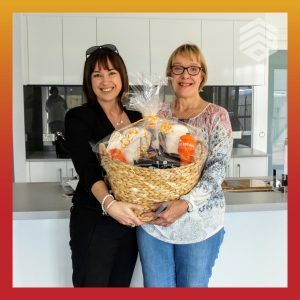 It was a very overwhelming experience being first home builders, but Sarah and Lisa really talked us through it and made us comfortable with the decisions we were making. How did you find your experience through the construction of your home? Through the entire build we were kept up to date with everything! It was so good to have weekly updates from Amy that included pictures so we weren’t in the dark about anything! Troy was also really great! Any time we had questions or concerns on site he was able to either answer them instantly or find out for us. What did you enjoy most about your journey with Integrale Homes? We enjoyed the fact that it was such a stress free and easy process! Nothing was ever too much for the team and we felt like we were really guided through step by step! It’s very difficult being first time builders and not knowing what to except, but Integrale could not have made it any easier! Based on our experience building our first home, we would definitely choose to build with integrale again! It has been very hard to fault the entire process!! Woody and the team did such an outstanding job. the attention to detail was impeccable..
Why did you choose Integrale Homes as your preferred builder? I was drawn to Integrale’s “Total Package” with everything included and no hidden costs! – what more could you want! My colour selection appointment was made so easy by the amazing Sarah. before going I was so daunted and worried I would make terrible choices but Sarah took me through everything seamlessly and made it fun! I have a wonderful looking home thanks to her. How did you find your experience through the construction of you home? Woody and the team did such an outstanding job. the attention to detail was impeccable and I treated the construction of my home with the work standard and care they would their own. I have been especially impressed by the after construction support and service. I had a minor appliance fault after moving in, once I notified the Integrale team they took care of everything with no delay. They check in with me often to make sure I am still as happy with everything as the day I moved in which I more than am! 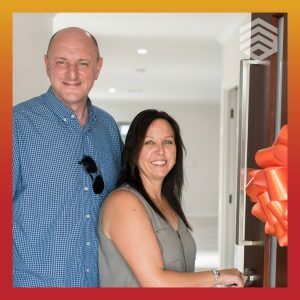 We had some great recommendations from friends that encouraged us to choose Integrale after we decided to build our first home. 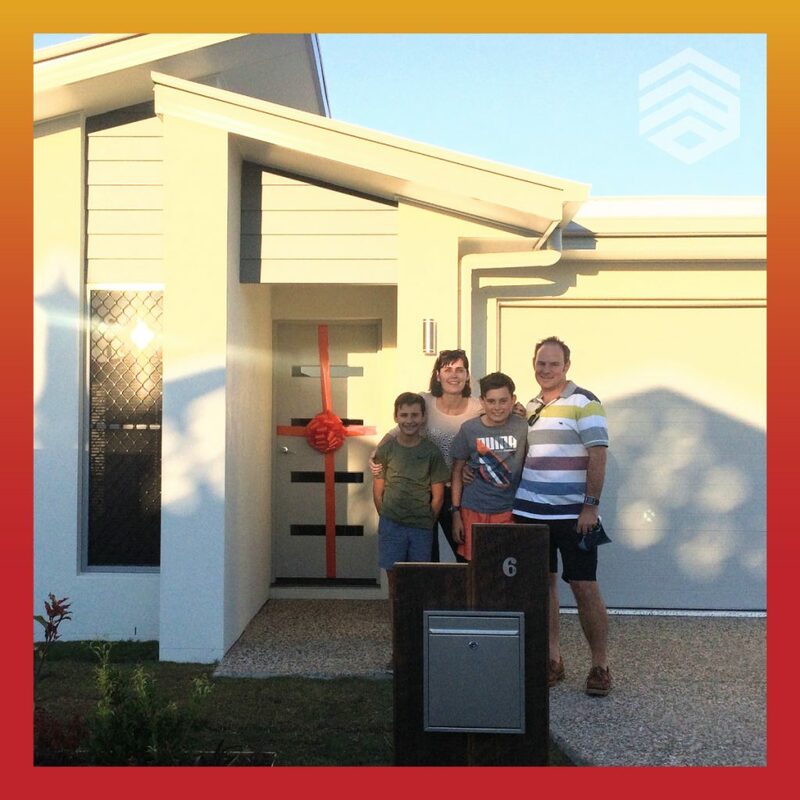 We simply fell in love with the display home at Birtinya. supervisor worked well. Overall we were very happy with the construction process. Receiving the progress reports weekly. The total Package is excellent for 1st home buyers. Really good, there was a few minor things missed however all in all, good. The consistency through staff, honesty & the quality and standard was great. We enjoyed all the process. From the first contact with Bennet to the handover with Amy-lee and Troy. Only positive impressions! No stress at all! When we made a decision to build a house with integrale homes. We were living in Melbourne. So we contacted all Sunshine Coast builders by email or by phone. The common answer was you need to come here guys to discuss there was only one sales person who responded on all our enquiries very quickly and he gave all answers to all our questions. His name is Bennett. We’ve never heard about integrale Homes before, but thanks to Bennett and his patience, we chose Integrale without any regret. We had a colour selection with Sarah she is awesome! She helped us get all we wanted. That was also a big pleasure to work with Amy Lee and Troy they are awesome! They really care about the customer and the brand they represent. Thank you guys that was a great experience! They had perfectly designed houses that suited us right now and our future, also the turn key package. Amazing! we could not fault Naomi, she was so fantastic. 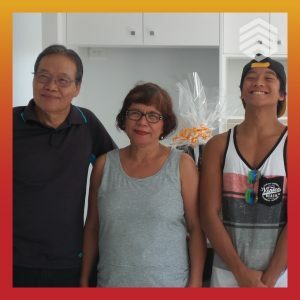 very good, we where quite nervous as this was our first house and having to choose colors that would be in our home for a long time was quit scary, but with intergale they calmed us and helped us at ever point. once we got in and started they made it very fun! Stress free, Matt was only a call away if required & very approachable. how easy and stress free it was, the whole process was so fast and easy it was really enjoyable! yes 100% i could not fault the experience we had and i have already recommended and will continue to recommend integrale homes! just amazing the whole team was. 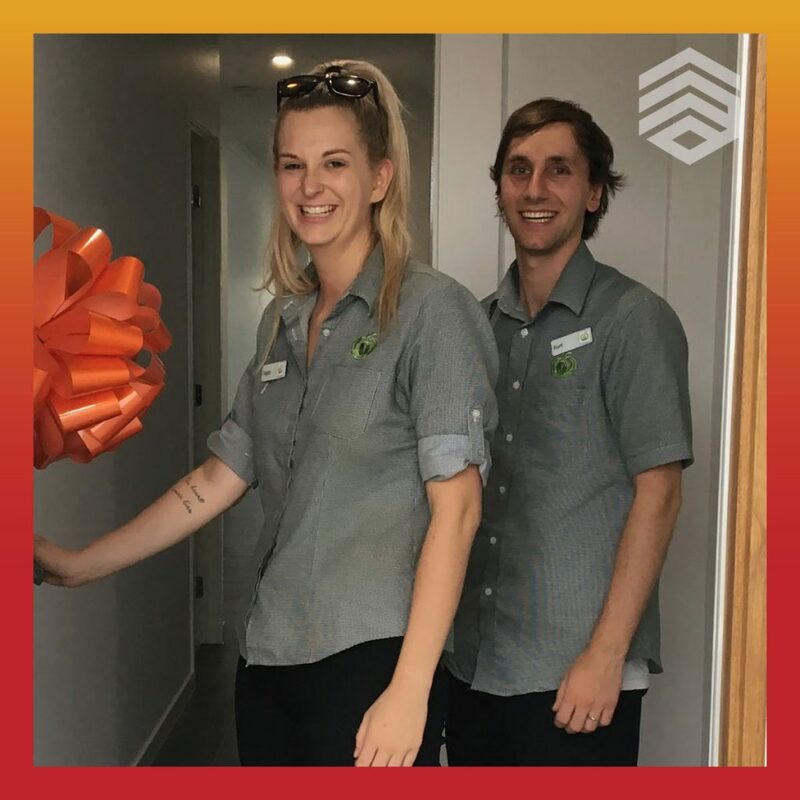 special thanks to Troy our site supervisor who went above all our expectations, Naomi who was just so amazing she was so friendly and lovely to work with from the beginning made us really excited from the get go even now if we bump into her in the new aura display homes she wants to see photos and is so excited for us! and also Amy-Lee was amazing to work with! she was there all the time for us with anything that we needed and always went out of her way, sending us the updates every Friday telling us was was planned for the next week was something we both loved! thanks so much to the whole team at integrale homes was so fantastic to work with you and we love our new home so much! Just a massive thankyou for making this experience incredible & most of all creating this wonderful house we can make our home. It is all quality. After extensive shopping around, no other builder could match Integrale’s packages, the staff were very approachable & they also came highly recommended. Second to none. Bennet Hunt was extremely helpful & knowledgeable. No question was left unanswered. Bennet was always very happy & such a pleasure to talk to. AMAZING!!!!! We had the privilege of working with Stacey who is a true asset to Integrale. We walked in very nervous as we were first time builders & walked out so happy & excited. No stone was left unturned, the selection’s were incredible & once again we were treated with the utmost respect & Stacey was very patient with us. From the very first day, it was a pleasure. Loved the weekly updates & photo’s. Congratulations to you for surrounding yourself with the very best on the Coast. There were no nasty surprises ($$$$) as all pricing was provided before the build started. I’ve heard from many people who have built previously that they would never do it again but we cant wait to build again with Integrale. It was an absolute stress free process, we thoroughly enjoyed it. Thank you also to the wonderful Amy-Lee, you were always there, always returned a call that day & nothing was ever an issue. ABSOLUTELY, in fact we always do if we hear of people thinking of building. The total fixed price package was appealing, especially for first home builders and especially the feeling of knowing the build cost, that did not change. Our sales consultant Bennet, was a determining factor as to why we chose Integrale Homes. Due to our block being slightly smaller than 12.5m, Integrale had a perfect house design for our block that suited within millimeters. Bennet was amazing! He is so knowledgeable and went the extra effort for us throughout the build process. We chose Integrale Homes because of Bennet. He was so friendly and helpful, answering all our questions, and continually impressed us with his initiative to make our house more amazing. His communication was great, despite me being overseas and interstate. The build process did not end with the sale for Bennet. He followed up and ensured the build process was completed satisfactory. Colour selection with Sarah was good. Sarah is a lovely person with a friendly and bubbly personality. Amy-Lee communicates extremely well. We were very happy with her communication via weekly updates. Amy-Lee was extremely accommodating, despite our difficult interstate rosters and limited availability to visit the house. Matt the site supervisor, ensured the house was finished to perfection. He ensured it was finished to the highest of standards. Matt made changes upon request and actioned these swiftly, which was most appreciated. The journey was relatively easy, as Integrale did almost everything, which ensured an easy handover and quick transition to making it a lovely home to live in. if/when we decide to build again. 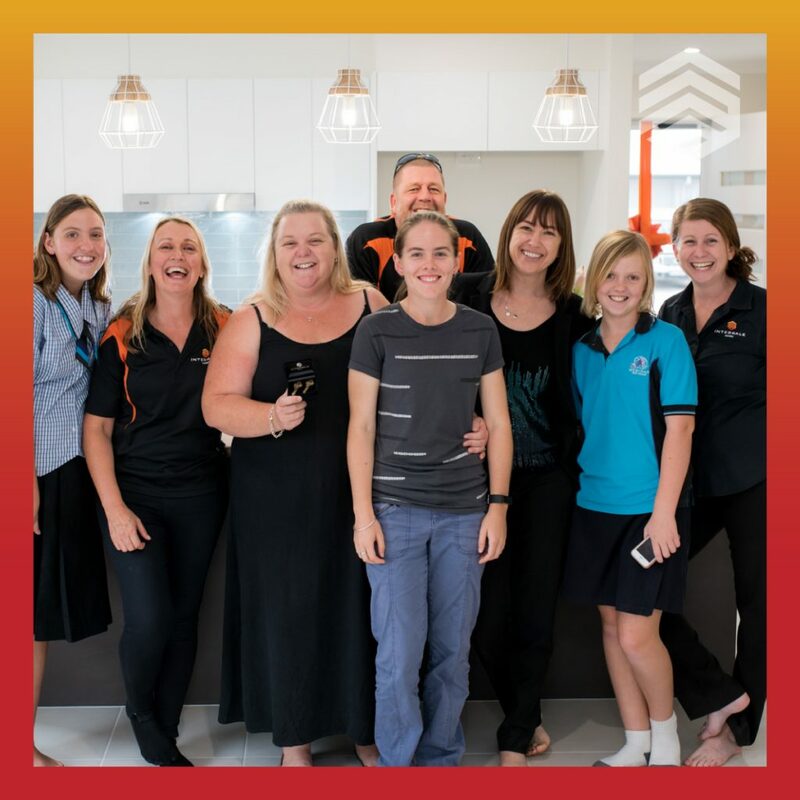 We'll just go and see our mates at Integrale Homes and know we'll be looked after like friends. Originally it was for the Tesla H&L package. But we continued because the of the fixed price guarantee after we missed the Tesla deal. Bennett was the best consultant we had spoken to in the process. And we spoke to quite a few. Turned out, he was also the last because he was very good to deal with. Didn’t push the hard sell and nothing was too trivial for him to deal with. He knew we had a smaller budget and treated us like we were his only client. Sarah was great. Very easy process. Simple layout of what was available to us. Even though we were kinda doing the poverty pack, we were treated VIP’s. Sarah was very helpful and displayed lots of patience when we were unable to decide what we wanted. Her input and ideas were a great help. This was the most nerve wracking thing of the whole process. Amy Lee and Matt seem very aware of this. The weekly reports and the regular site visits were great in easing our stress over the project. Amy in particular was so supportive and approachable and we enjoyed such a relaxed relationship with her. The light banter and ease of communication are things that a lot of project managers lack. You have a good asset in Amy. Matt was everything you expect from a builder, only better. Very upfront and matter of fact. Which I believe is exactly what you need from your foreman. The fact that the builder was actually the LEAST stressful part of the project. Integrale look after the client and make the process so much easier. You guys recognise that efficiency in the lead up to breaking ground is a huge factor that determines whether someone would want to build. We literally had other builders tell us we had to do all the legwork to get the build going, something we had neither the time or experience to do effectively. Integrale have it all covered. And that to me is a huge reason why we decided to build with you. Absolutely. And already doing so at every opportunity. Even the neighbours next to the new house wanted to see the finished product and have expressed regret that they went with the builder that they did after viewing our property. A very big thank you to Bennett, Sarah, Amy and Matt. They are a credit to your organisation. We are already primed to look into building again if possible next year and would be delighted to work with these staff members again. As far we are concerned, at this point, there would be no reason for us to look elsewhere if/when we decide to build again. 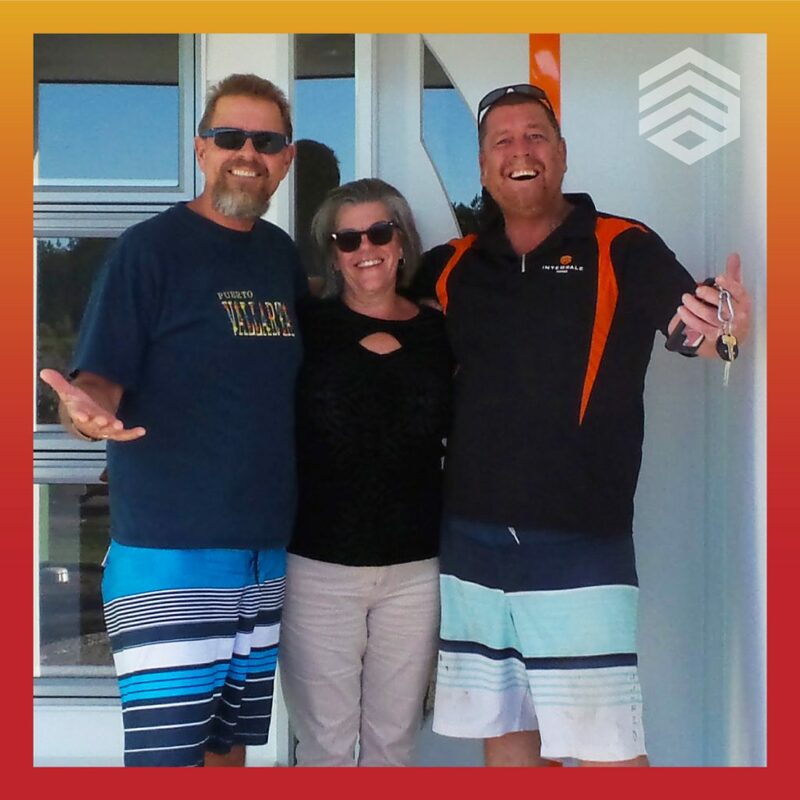 We’ll just go and see our mates at Integrale Homes and know we’ll be looked after like friends. 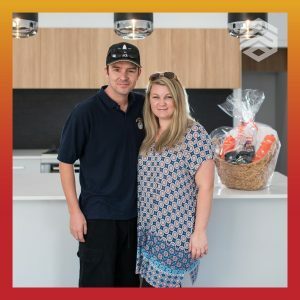 We looked through a lot of Display Homes and Integrale Homes stood out to us because of their friendly sales consultant and modern Display Homes. Bennet was helpful, friendly and informative. Colour selection was made less overwhelming by the wonderful interior designer – Sarah, who guided us through every discussion. Amy and Matt were informative and helpful. The weekly email updates and site visits made the building process enjoyable. They were always available to answer questions throughout the process. I chose Integrale Homes because I wanted to go with a company that I knew I could trust and wouldn’t take advantage of me. I also greatly respect the way they (Integrale Homes) invest back into the community. Stacey was so lovely. I was so worried about colour selections as this is not my forte. Stacey took my little dream book that I made and helped me- Not took it off me – but helped me design my house. She got me involved in every decision, she gave me options and worked through the pro’s and con’s of colour choices and fixtures and fittings. Where I had visions of fixtures and fittings that weren’t in the display room – Stacey when straight to her contacts to source what it was that I looking for. I think of stacey often as I am in my kitchen preparing meals as it is my favourite space in the house and I am grateful for her input and skill. I loved getting my emails every week from Amy. What a joy to be able to see the development of my dream coming together. Once again, Amy dealt directly with my mortgage broker which helped me out drastically as they could speak building and bank lingo to one another and it was seamless. I was so grateful for all the extra miles Amy went to to see that my invoices were raised promptly, sent to me quickly and therefore could be paid as quick as possible. If problems arose during the build, Amy was quick to help me with a solution. My site visits with Matt were also a highlight, I was left with no doubt that Matt would see the construction and fit out of my house would be of a first class standard. 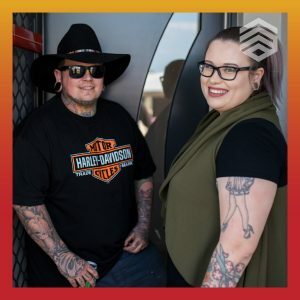 Matt is a great guy who treated me with respect and care, he was thorough with his site visits, he was humorous and always made time for you..
oh gosh, I can’t pin point one part. The whole experience was relatively effortless. Where people said building is one of the most stressful things you can go through – Obviously they didn’t build with Integrale Homes. The entire team made my build process the best, most enjoyable experience I could have gone through. I now have my dream home which I hope to fill with little foster care children who need a beautiful home. thank you for making my dream come true! nope, but keep going guys, you all do a brilliant job, you are all such professionals and you all do an amazing job. We recommend Integrale to everyone we speak with, whether or not they are building. 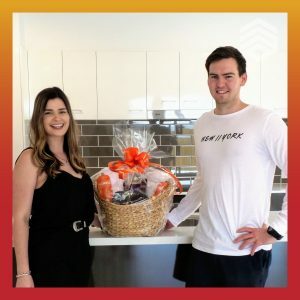 Having walked through all the display homes dreaming of what we could have and do, we walked into the display home at bells reach and fell in love with the home and its layout. from this we started speaking with Bennet and before we knew it we were buying land and the process starting. for us the value that was going to be achieved was too good to pass up. to also have the pool included within the build coast was great as we didnt have to have another loan from the bank. Having lived in the house for a few months now we are constantly hearing the horror stories from our neighbours with their building journey. We are so blessed to have chosen Integrale Homes and if we ever have the opportunity again to build we will build with Integrale and the team. 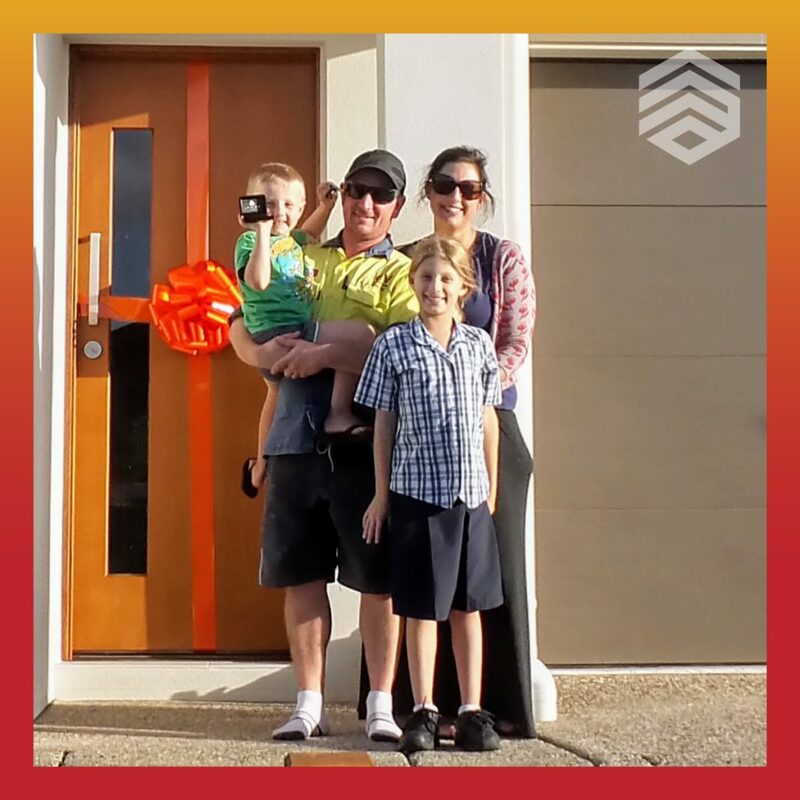 From Bennet, Sarah, Matt and Amy… you made this journey pleasurable and memorable, you guys make Integrale Homes. ....The "all-inclusive" package with no surprises, was a major factor for us.... we knew exactly what was going to be included from the start. We had looked at literally dozens of display homes, but it was the friendly, helpful advice from Steve Walters. The Seaview 322 was the very first house we ever looked around, and we never found anything else that could match it? Plus the “all-inclusive” package with no surprises, was a major factor for us…. we knew exactly what was going to be included from the start. Steve was fantastic….. we told him we liked the Seaview, but didnt want the master bedroom at the back of the house….”No problem… leave it with me” was his response. After a few days, he came back to us with a fully redesigned upper floor that gave us the master bedroom at the front. Nothing was too much trouble for Steve, and he designed a home that is practical, functional, and beautiful to live in. Sarah was amazing ! She guided us through what can be, an incredibly stressful & important process, keeping us focused, and not letting us overlook the minor details that create the overall look to the home. She was extremely patient throughout, even when we changed our minds or wanted different upgrades. Sarah was a pleasure to work with, and made us feel like we were designing our own home, and not just one of many…. a very personalized experience! Words cant describe the excellent service we received from our site supervisor Troy ! 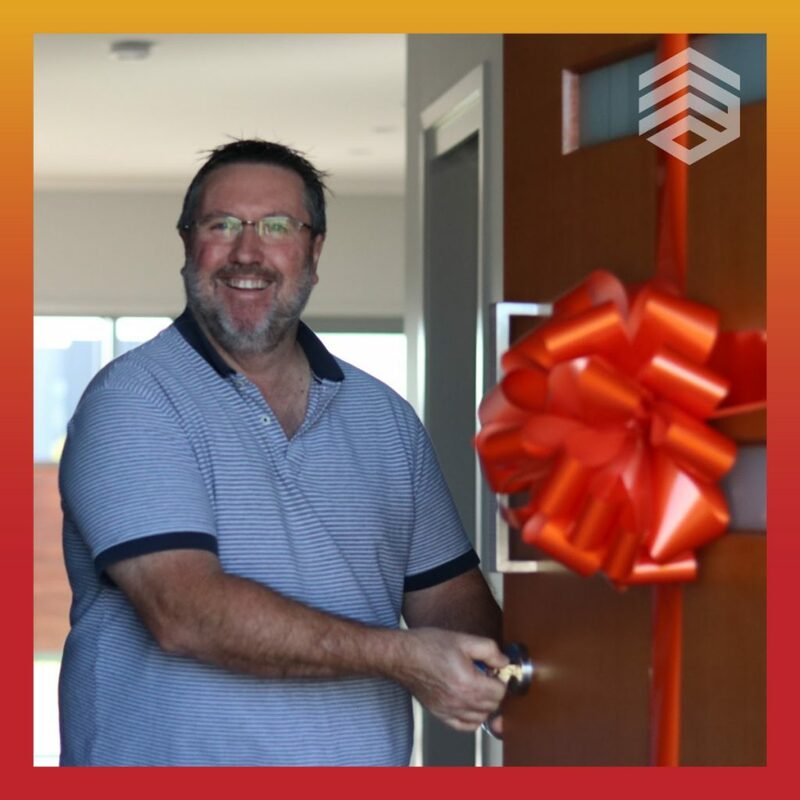 Any issues that arose during the construction were dealt with quickly, efficiently and professionally by Troy, and he went to great lengths on our behalf to ensure that the highest standards were met on our new home. He was always available to offer practical advice and answers to any queries that we had. 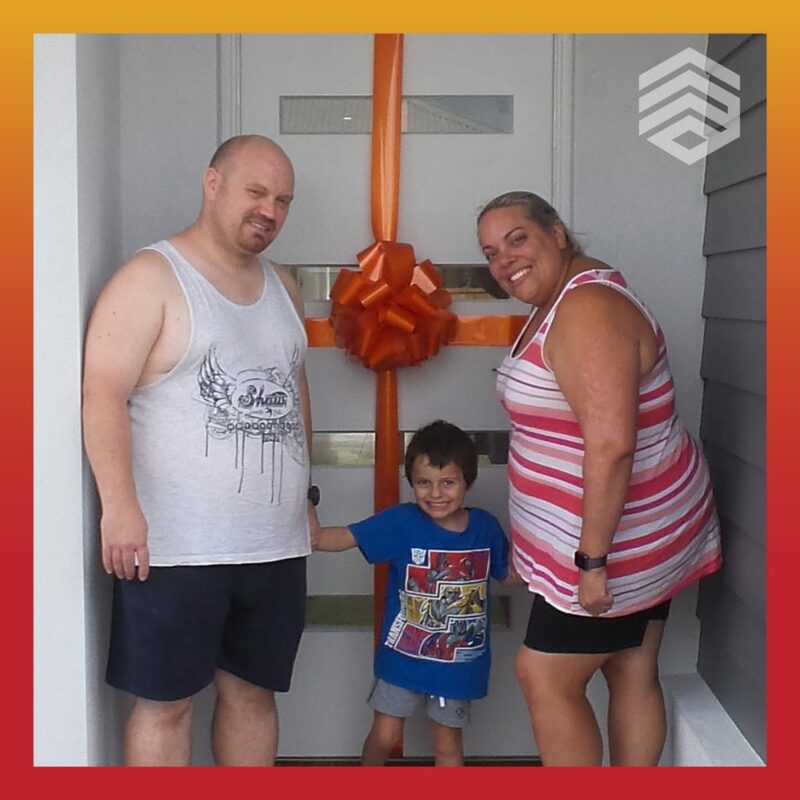 We both felt that Troy was personally invested in the construction & completion of our new home, and we always felt that he had our best interests at heart. The individual service provided by Amy-Lee made the entire process so much easier. 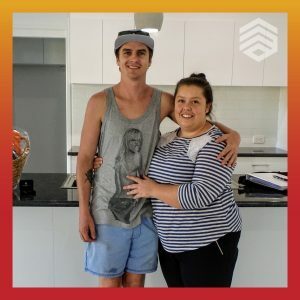 Amy is a great communicator, and her weekly updates on the progress of our new home were always eagerly awaited, and were invaluable to us, giving us peace of mind throughout. Nothing was too much trouble for Amy, and no question was ever too trivial to answer. We always felt that we had someone at Integrale that we could discuss anything with…… she was our “go-to girl” !! Absolutely…. without a doubt! When people find out that you’re building a new home, the first questions are always ” who are you building with,& how is it going” ? We have always been able to respond positively about our Integrale experience. We had very specific ideas about certain features that we wanted to be included in our new home. The entire team at Integrale were very flexible & worked tirelessly to ensure that our wishes were met, even when some of them were not on the original plan for this style of house, making this a truly individual home for us & our needs. We chose Integrale Homes because we loved the Display Home in Peregian Beach as the layout suited our family and block of land perfectly. Colour selection was also great! Sarah was very patient and helpful in all fields. It was fun matching all the colours for our new home. Our experience through the construction was good. Being our first build , it was obviously difficult to compare, but overall everything went smoothly. We enjoyed every stage of our home being built and coming together. We chose Integrale Homes because of the amazing quality and beautiful design of the show home that we saw in Kawana Waters. Our sales consultant, Karen Fraser had such an amazing personality and was so professional with her work. Every request I had she fulfilled without hesitation and I felt a strong connection with her. Karen was the prime reason for me choosing to build with Integrale. My designer, Amy-Lee was so helpful with colour choosing and designing, as alone I would not be able to choose everything to perfectly match my dream house. The construction was smooth, professional and didn’t have any hiccups. The construction supervisor, it was quick to deal with any problems or questions that I had. This is the 4th time building my own house and it is by far the best. What a smooth and easy process for our first home! Great! Rita never made it feel like she was pushing anything on to us. She made us feel really comfortable when it came to all the paperwork and was very organised. 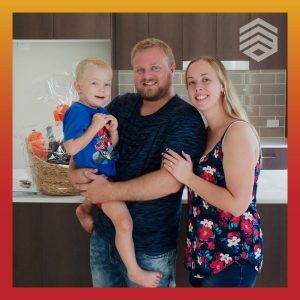 When we visited the display home in Parklakes we liked that everything was basic but the house still looked really well done and the floor plans of the house best suited us. Also the rent relief (promotion) was a great incentive. Overall it was great! Being our first home, we didn’t realise how much was involved with colour selection. Sarah helps us through the process really well and we are super happy with the end result. Super easy, Amy-Lee was so organised with everything, it went really smoothly. We always felt in the loop throughout the construction with our weekly emails. 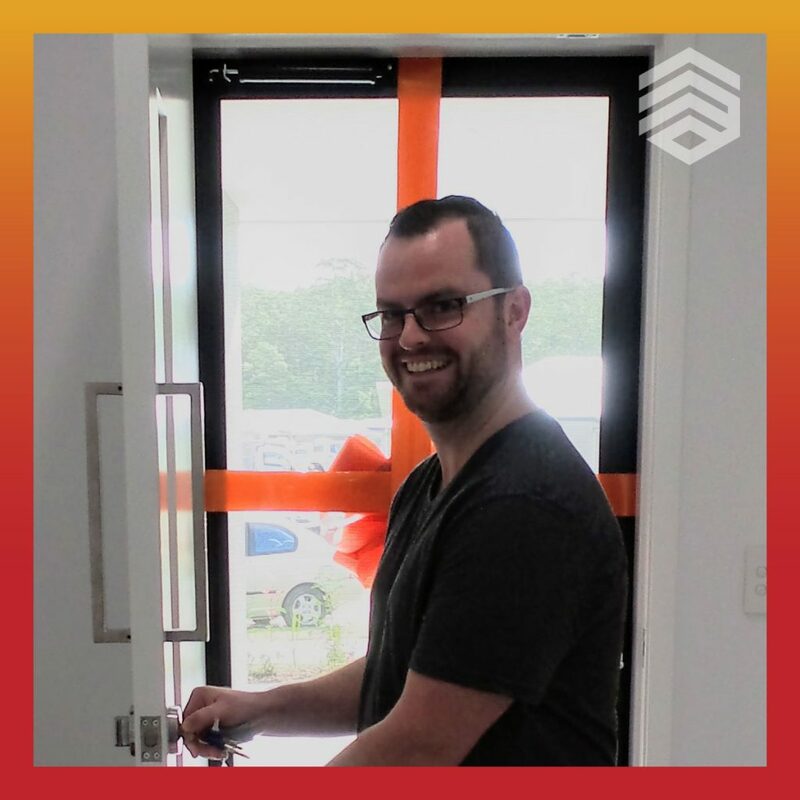 Troy is a great site supervisor as well, at all of our walk-throughs (Site inspections) he was really easy to get along with and quick to take care of any issues we had. We enjoyed how quickly the build was and how organised the whole Integrale team is. What a smooth and easy process for our first home! Stacey and Sarah made what I thought would be a stressful time very easy to deal with they were both very helpful and gave good guidance. I liked that everyone from start to finish was fantastic to deal with. They made building my first home a breeze. so helpful and friendly. Enjoyed the whole process with you all. Absolutely! Hands Down! No Question! It is not dreadful to build after all! As long as you build with the right builder and right people! Thankyou so much Integrale Homes! Everything went well we always looked forward to being toured around our home during this stage. Even though we were always late for inspection times, Matt our supervisor waited for us. We were well informed at all times on what needed to be changed . Our Integrale Home is not perfect, but we love it. We were so much part of the building process. It is not dreadful to build after all! As long as you build with the right builder and right people! Thankyou so much Integrale Homes! Kahl was a wonderful sales consultant. He was kind and welcoming. He was very knowledgeable and gave us different ideas on how to utilize space. We liked that Integrale did the ‘total package’, and that there were no hidden costs. We also liked the floor plans that were available. The colour selection experience was great. Sarah took her time to explicitly go through each item. She also had good suggestions about colours that work well together etc. We loved receiving the weekly updates from Amy regarding our homes progress. It was great to meet with Troy at each stage completion meeting. He was very friendly and would answer any of our questions. 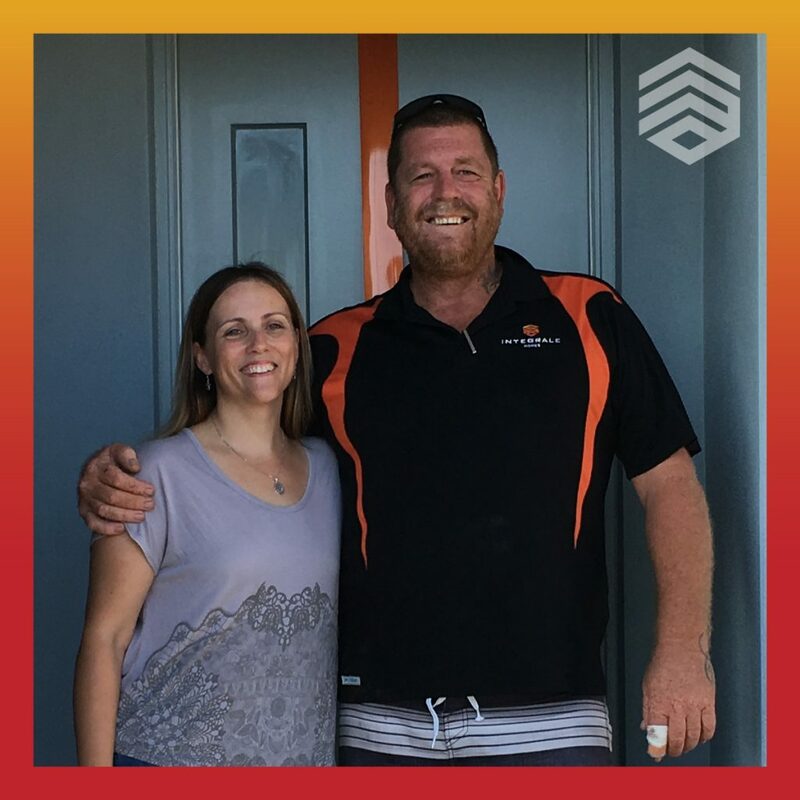 Amy and Troy both went ‘above and beyond’ to ensure everything was on track and fix any small problems that occurred along the way. The friendly, helpful staff and seeing our home take shape. Of course, also the hand over meeting where we received our keys to our beautiful home. Yes definitely – we actually already have and they are building with Integrale now! Hooray! Would you recommend us to others? Definitely. You've all been lovely to deal with and have made building my first home straightforward and fun. I went to have a look at the display village in Parklakes 2 unsure that I was even ready to build yet – just sick of renting and exploring my options out of curiosity. 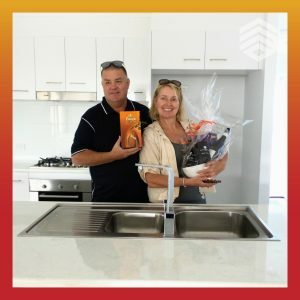 The Integrale display home was one that stood out and the sales team were incredibly helpful without being pushy or brushing me off. Brilliant. Kahl was super helpful from the beginning. I knew very little about buying/building houses so he simplified it all for me and answered all my questions while having a laugh with us at the same time. 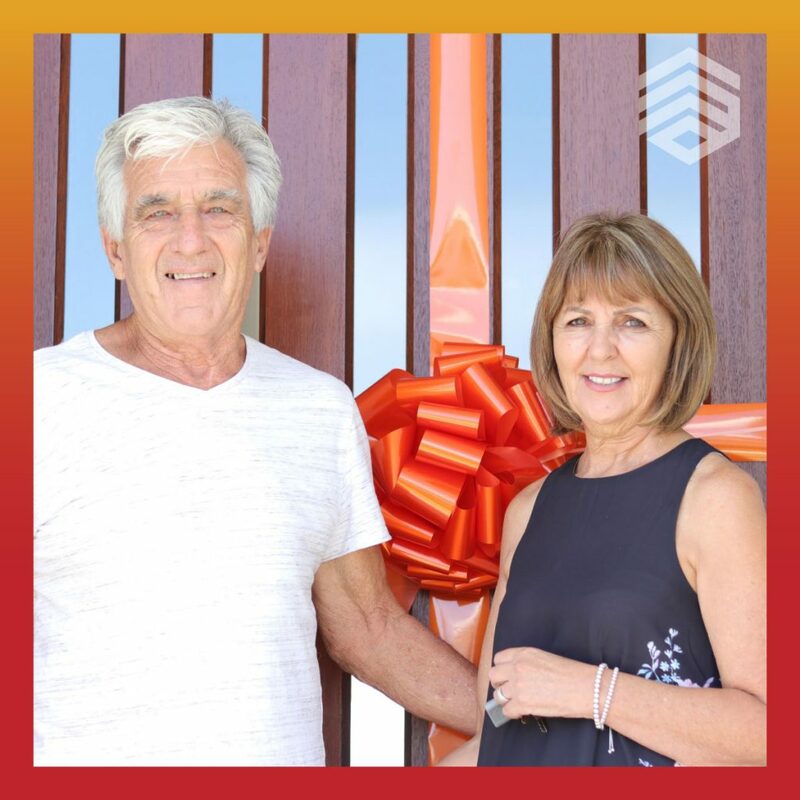 He contacted me a few days after I visited the display home as he had found a block of land perfect for me – It was the one I ended up buying! Great. I had heard horror stories of other people having multiple dramas throughout their build but mine was entirely stress free and ran to schedule. It was great getting weekly updates of what had been done on site and to be able to visit and meet with the site supervisor at each stage as well. Probably seeing the house come together into the finished product! 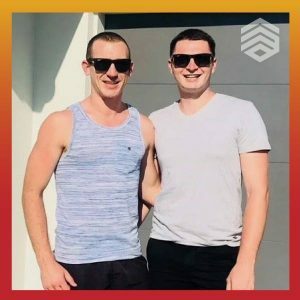 The site visits and weekly updates have been great too. Definitely. You’ve all been lovely to deal with and have made building my first home straightforward and fun. Thanks for everything.. I love my home! Our experience has been very positive. From the start of selecting a plan right through to handover of our beautiful new home. We liked the idea of the complete package & fixed price. Looking around at the display villages at Birtinya, Bli Bli & Peregian breeze were all impressive, well planned homes. Steve at the Peregian Display home was fantastic. He had some wonderful ideas as to how to change the house plans around to suit our needs. He was helpful with facade options and nothing was ever a bother for him. Colour selection was so much fun. There is plenty of choice and Sarah had some wonderful ideas with tiling options. Working with Integrale has been such a positive experience. Friday emails and pictures would have to be the highlight, We enjoyed seeing the changes every week and our new home taking shape. We would absolutely recommend Integrale to anyone looking at building a new home, in fact we are already spreading the word at how wonderful they have been. We would not hesitate in building another property with Integrale if and when we decide. finish were amazing. We are so grateful that we made the decision to build with you. Thanks again. You guys rock! Super stoked with my new home. You guys have been nothing but professional through every step of the way. You guys rock! Super stoked with my new home. You guys have been nothing but professional through every step of the way. Just wanted to let you know how much I appreciate everything you have done for me. I looked at many display homes and chose Integrale as the design of the Seaview 245 suited my needs. Also i liked the idea of ”The total package” as a great marketing promotion as i did not have to worry about organising landscaping. Brilliant, Karen was so helpful & full of great ideas and suggestions. I cannot recommend her highly enough!!! Sarah was enthusiastic and helpful & reassuring. I was slightly apprehensive about the colour selection process, so much to consider about colour combinations, textures & appearances (not my forte) I am extermely happy with the outcome. Great, the weekly email update is a great way of being kept in the loop and also gave me the opportunity to respond to any questions i had during the build process. This is the 5th new home i have built and was by far the easiest and stress free building project i have been involved in. The whole build was a well organised and smooth process from start to finish. Definitely, everything that was promised.. was delivered. Lorie, thank you so much for all feedback and assistance. Not one process could be faulted, Integrale made it so easy to build our first home and made sure we were happy. We were recommended to talk to Lisa from a friend. After looking through multiple builders all over the Sunshine Coast we were so happy with what Integrale were offering we couldn’t say no! Lisa was AMAZING!!!!! She understood that my husband is a sole trader and works 6 days a week. Being able to have the flexibility with this was so helpful! The experience with coming up with the idea to remove walls to make the space our own was so easy! We thought that changing the plan would be costly in the long run but Lisa made sure to reassure us that it was all covered. She even popped her head in during our colour selection to help us tie our en-suite together with our main bedroom! Sarah didn’t blink an eye when I told her a black kitchen was a non negotiable and she made sure it was to die for! She worked with the ideas we had and understood where we were coming from. The entire time was so much fun all i can remember was laughing throughout the entire thing. Lorie kept us up-to-date with everything! She made sure our updates were there every Friday and always kept us in the loop with our retaining wall construction with a neighbour. Michael was easy to deal with and understood that when we did walk through we would be particular about even the little things, BUT SO WAS HE! EVERYTHING. 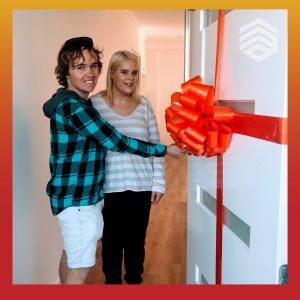 Not one process could be faulted, Integrale made it so easy to build our first home and made sure we were happy. Over and over! Even suggested it to the guy that came to install our Foxtel the day after handover! Thank you so much for dealing with us since march! it was an experience we will never forget! Everything ran smoothly and my home was finished two weeks early. I was given regular updates and sent photos which was great to see my home as it progressed. The colour selection was a lot easier than I anticipated I had a fair idea of what I wanted and the team made it extremely easy to put all my ideas together. Sarah was bright, enthusiastic and informed about the products. Sarah accommodated our ideas and colours as well as introducing options. 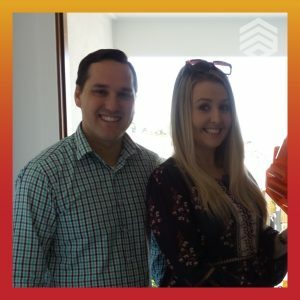 Both Amy and Matt kept us well informed on the Build and were also readily available to assist us in anyway. 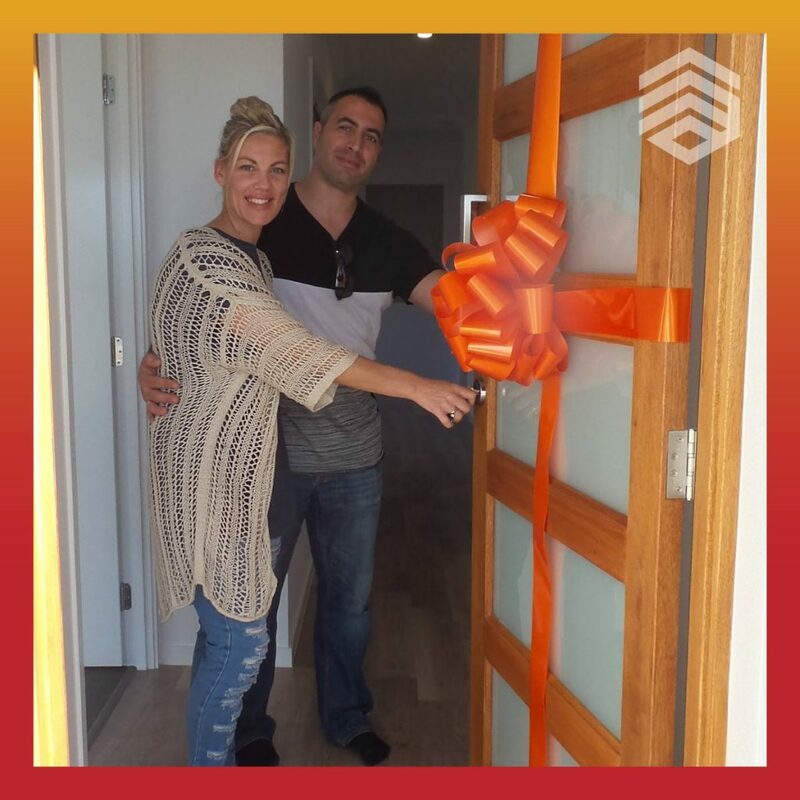 Amy and Matt were both as professional and passionate about our build as we were!" Our colour selection experience was enjoyable. Sarah was bright, enthusiastic and informed about the products. Sarah accommodated our ideas and colours as well as introducing options. Both Amy and Matt kept us well informed on the Build and were also readily available to assist us in anyway. Amy and Matt were both as professional and passionate about our build as we were! Integrale Homes offered us a total package so that when we finished the build there was nothing to do. Integrale Homes offered us a total package so that when we finished the build there was nothing to do. Compared to the other builders the package represented value for money and we were pleased to build with a local builder. Naomi was patient, thorough and very helpful. I would highly recommend her. The colour selection process was well-organised and enjoyable. Throughout the construction of our home, Integrale Homes keep us informed at every stage. The weekly emails with photographs were useful..
Our site supervisor looked after us well – all queries or issues were dealt with quickly. 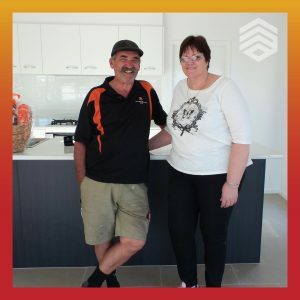 We’re very satisfied with the process of building with Integrale Homes, the house design, the quality of finishings and the final result that included everything from landscaping and letterbox to blinds. The friendless of Kahl when we visited the Bli Bli display home and how nothing was too much trouble. Very helpful and nothing was too difficult. Meeting with Sarah was great and she helped with the colour matching. Meeting with Michael when ever I wanted was great. The photos that were taken was easy to send to family and friends to keep them informed about how it was going. Getting the photos on Friday’s to see how the house was going. Yes because everyone was so helpful and would go out of their way to make sure the process went smoothly. Thanks to Integrale Homes for taking the stress out of building .. was greatly appreciated. Really like the Friday reports, kept us up to date with that's been done and what's about to be done to the house. Great deals and packages, also got recommended by a friend to Integrale Homes. A lot of things to choose from and the staff member was very helpful. Really like the Friday reports, kept us up to date with that’s been done and what’s about to be done to the house. Great people, easy to deal with and always there to help when needed. Yes, will definitely recommend Integrale to friends and family. The price was definitely a reason to start with then turn key package which included everything that was required. Plus we discussed with other builders as well about the turn key package and they wouldn’t give us driveways or won’t do the fencing so you need to pay them extra on top of one lump sum amount. 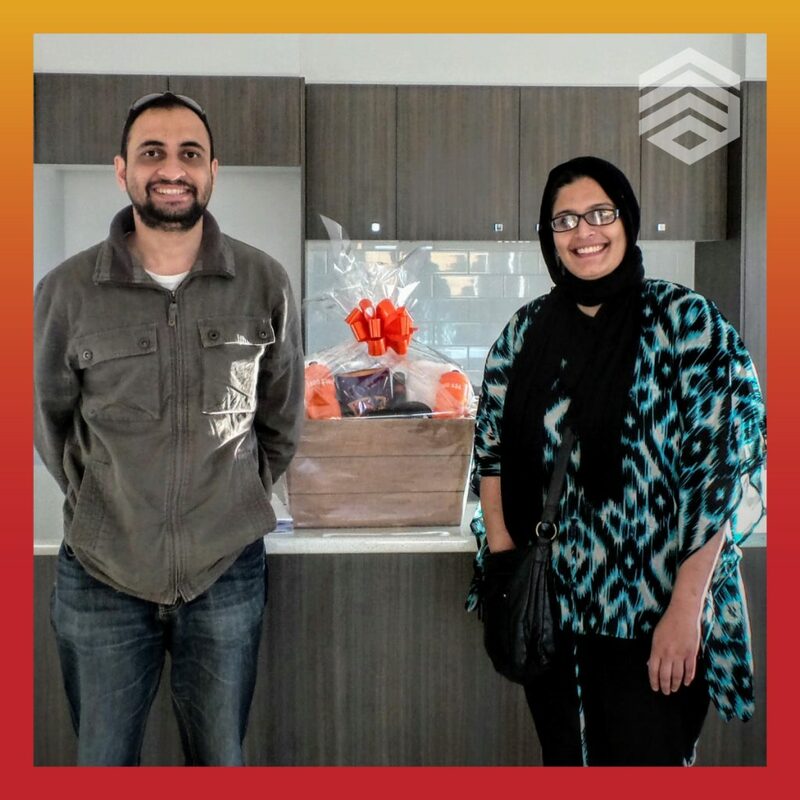 Naomi… our sales consultant was excellent, as this is our first home so she guided us very nicely and there was a comfort level that we developed with her. As we have other friends who were/are in the process of building and they were facing so much trouble with their builders with small issues that we had fear as well. But throughout the process from signing the pre-contract to the final handover we haven’t had any problem. AAA++++ service. Sarah is very nice and she knows about the colour combinations. She advised us on every aspect from tile selection to the driveways colour and was very cooperative while we needed the minor adjustment to the plan. Absolutely amazing experience. The 16 weeks guaranteed build time is just great. All our friends were so amazed by speed with which out home was built that they want to build their next home with integrale. If we build another home integrale will definitely be our builder. Matt has done an amazing job from slabs to the finish. Super happy !!! Amy has been so much efficient and so prompt in her responses that we were really impressed by her professionalism. Still if we have any questions we straight away give her a call and she is happy to assist us, thats a after sales service that we needed. Everything. Small adjustment for no or minor cost. Looking after our interests and doing the job promptly. The convenience to call us even after the handover.. is commendable. We were very impressed with Bennet Hunts Knowledge and compassion. He listened to what we wanted and nothing was a problem. He is brilliant at what he does, and it was pleasure to deal with him. Rob and I are so happy with our new home. Integrale Homes workmanship is fantastic and with all the help of your team we now have our beautiful retirement home – thank you! The overall experience was stress free and we felt our ideas and input were always heard and appreciated. I would definitely recommend Integrale homes to anyone that is wanting to build their future home to absolute perfection. We can't thank Integrale Homes enough. Why did you choose Integrale Homes as your preffered home builder? We decided to choose Integrale homes as our preferred builder as we were instantly drawn to the inclusions Integrale homes provided. It made it so simple and definietly less stressful planning our dream home from Interstate. The whole process was super easy and we were instantly drawn to the floor plan of the home we decided to build. 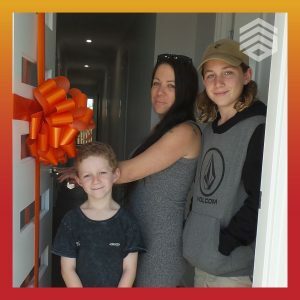 As the Alexandra 208 wasn’t a display home, we were going off the plan by making it our own with the help of Integrale’s friendly staff and it was everything we ever wanted plus more! 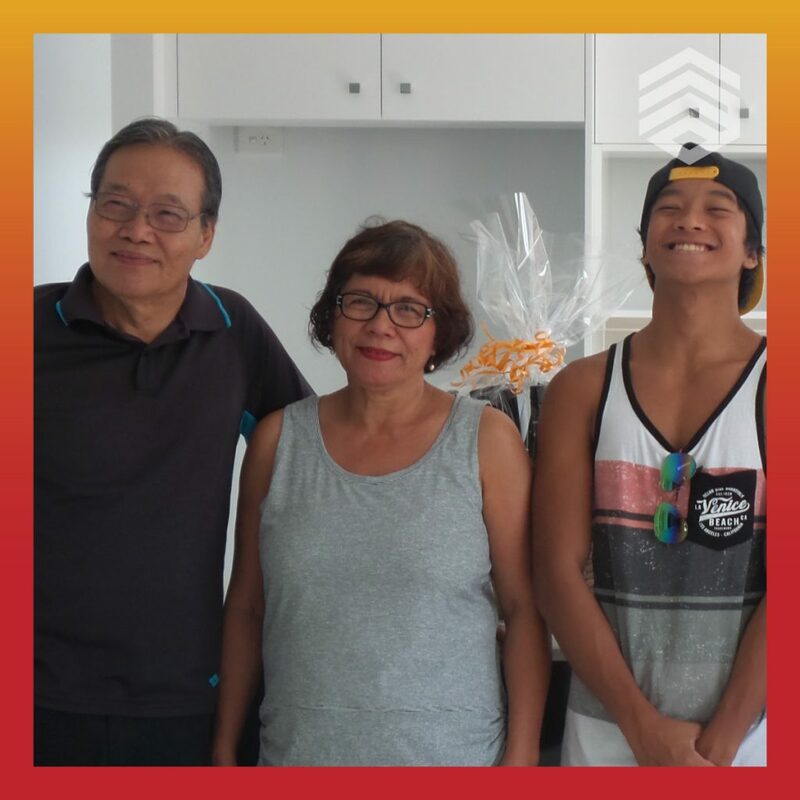 Rita was fast and efficient at providing us with plans with many different floor plan options to fit on our 450sqm block, the level of service was 100%. We were so excited for colour selection! It was a 3 hour appointment with Sarah and she did so well at assisting us with our decisions. The appointment covered all aspects of our home from every corner and crevices. It was an amazing experience. 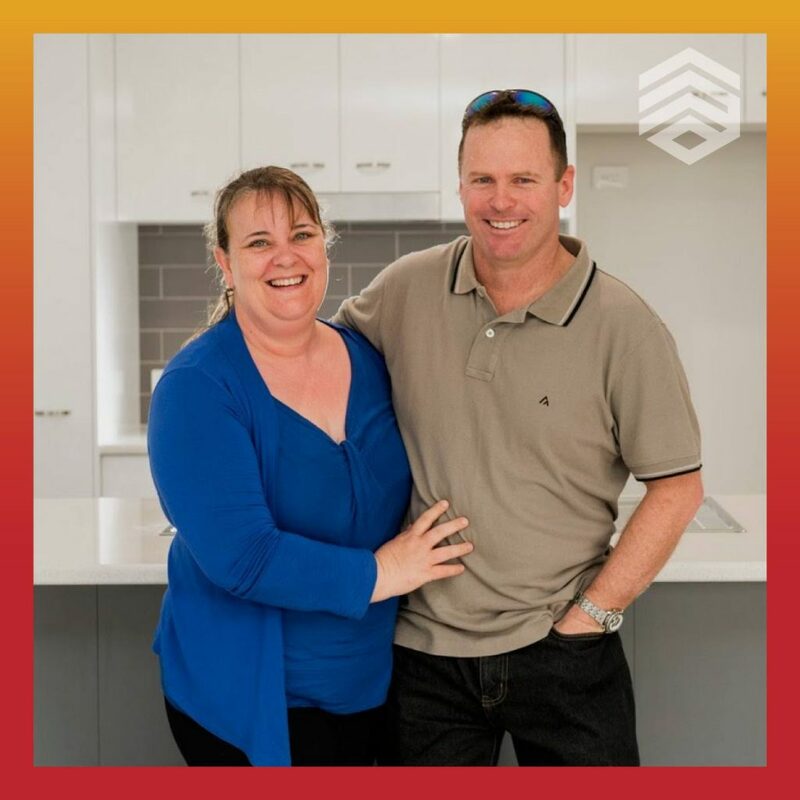 I first met Amy Lee at colour selection, Amy guided us through the whole process from receiving our building approval, weekly updates with photos to the handover of our beautiful Integrale home. One of my favourite parts was receiving the weekly update on a Friday with photos of the whole entire process. 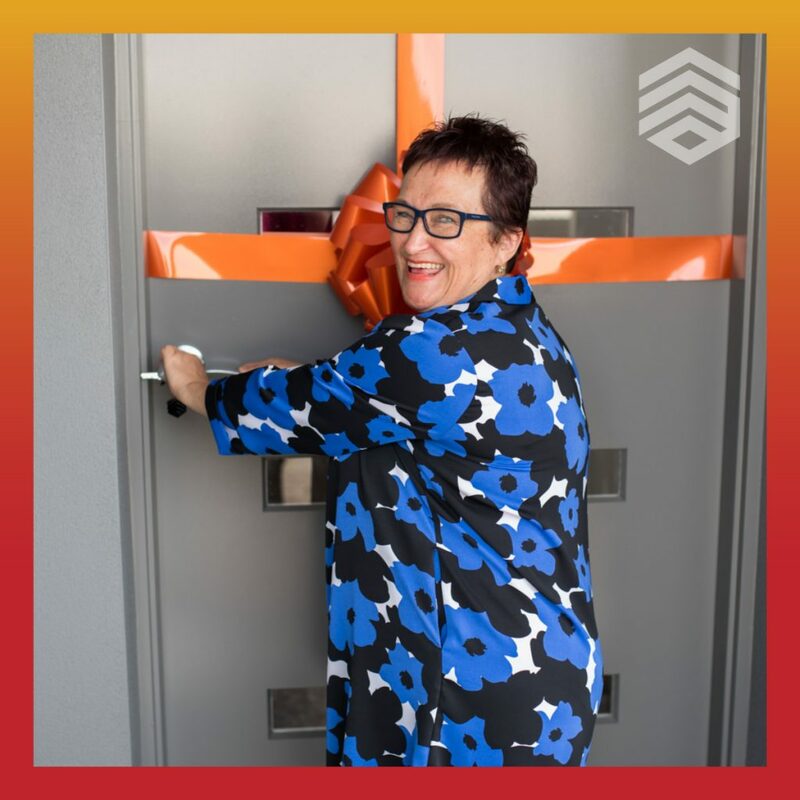 It was nice to have someone designated to this process that would share in all of these special moments throughout the building of our dream home. Troy our site supervisor was extremely thorough at ensuring every single corner and crevice was to perfection. It would definitely have to be the simplicity and stress free of our journey with Integrale homes. 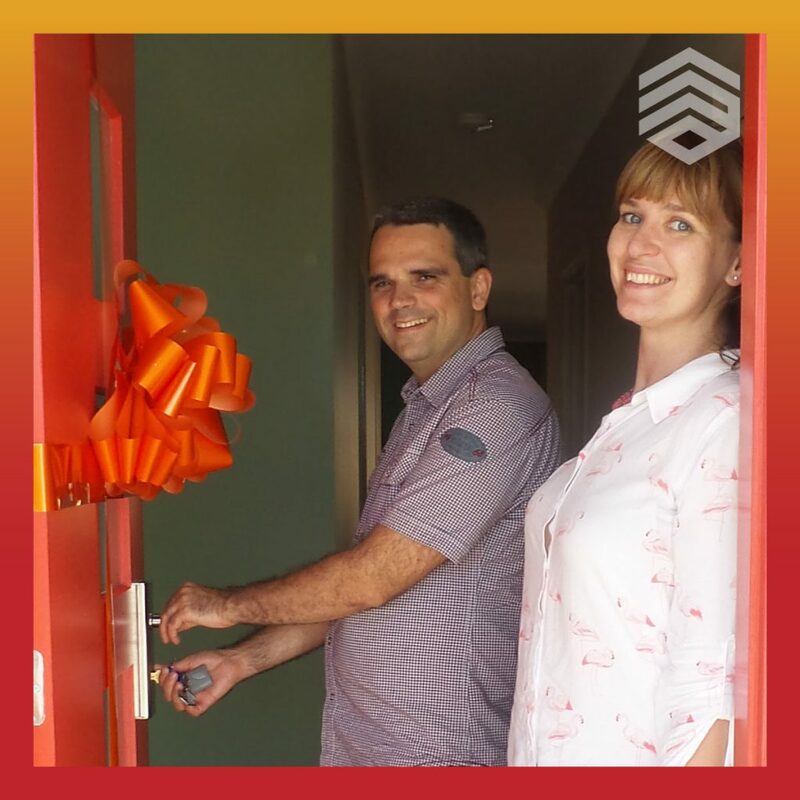 We enjoyed having the personalised experience throughout our build. It was wonderful to know our home was being built to perfection by the Integrale team and all of their contractors. Most definitely! 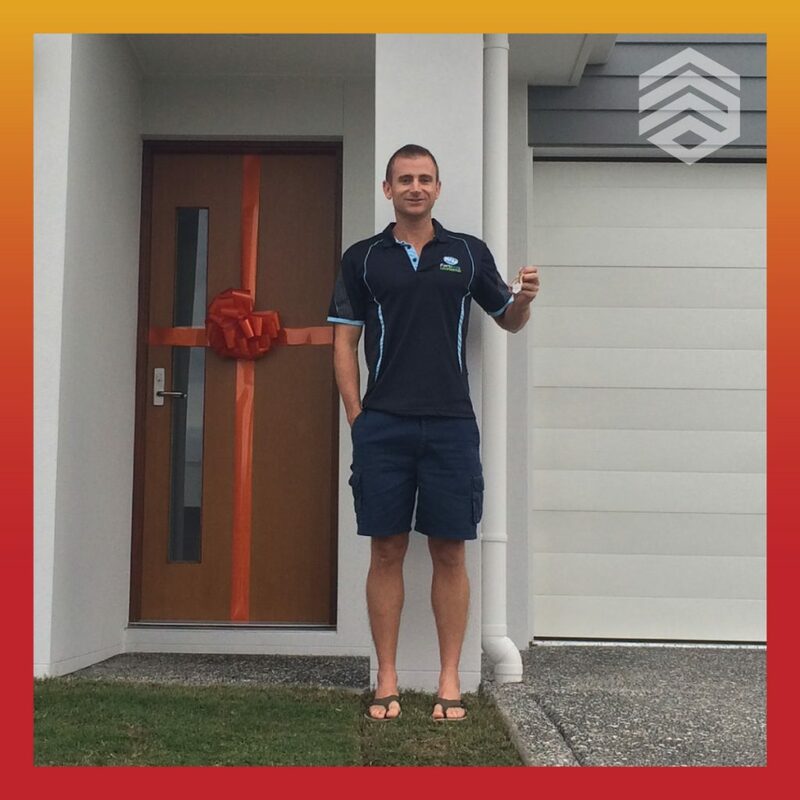 Jarrod’s sister has recently received building approval for their build with Integrale homes. I don’t think we could recommend Integrale homes enough! I would just like to say, we’re so thankful for the whole team at Integrale homes. From people behind the scenes, Sarah, Amy-Lee and Troy. Were more than thankful for choosing Integrale homes to build our dream home. Integrale homes went above and beyond to provide us with the most simplistic customer service we have ever received. With every package including absolutely everything we built our home to perfection with the wonderful recommendations on colours, the weekly updates and our frequent Inspections with Troy, our site supervisor. We’re absolutely astounded by the result of our Integrale home, Integrale homes went above and beyond with every corner and crevice built to perfection. The overall experience was stress free and we felt our ideas were always heard and appreciated. I would definitely recommend Integrale homes to anyone that is wanting to build their future home to absolute perfection. We can’t thank Integrale homes enough. To be honest Just trusted the sales rep, Steve. He was super easy to deal with and everything he said was going to happen did happen. Super easy, the displays were fantastic and Sarah was extremely helpful and happy to give her opinions but not pushy. Fast! Seemed to go really quick, didn’t have one problem I can think of. The email updates on a Friday afternoon and seeing the transformation in just a week was awesome, great to forward the pictures through to family and friends that were interested. Have heard some horror stories from friends with some other project builders but will be using Integrale again could not recommend you guys highly enough! Thank you! What I enjoyed most was the simplicty of the whole experience, the amazing people and the quality of my finished home. At the time I was looking to build on the Sunshine Coas,t I didn’t really know which builder I wanted to go with. I stumbled across Integrale Homes at the Bells Reach Display Village. I was impressed with the quality of the finish in the show home and the compatability for my block. Amazing, Naomi was awesome she assisted me with all aspects of the initial enquries right through to the contract stage. She made me feel comfortable with my decision. Her knowlegde, friendliness and professionalism is a credit to her and the company. This stage was the one I was most nervous about as Im not very creative, Sarah did a wonderful job helping me to visualise and offer suggestions. I walked away feeling very comfortable with my choices. It was seamless, I was located in Sydney and thought it might be a but difficult not being in QLD, Amy-Lee was awesome sending me my weekly updates and responding to any queries I had promptly. I’d like to mention Matt the site supervisor – I would like to thank him for the brilliant job he did in coordinating the delivery of my new home. Thank you Naomi, Sarah, Amy-Lee and Matt you are the most awesome people and I can’t thank you all enough. We ended up choosing Integrale Homes as our preferred builder because we loved that they include EVERYTHING in their packages. We ended up choosing Integrale Homes as our preferred builder because we loved that they include EVERYTHING in their packages. We were able to move into our new home and not have to worry about anything! The total package is so much more affordable than we thought it would be, and the rent relief was a huge plus for us! Excellent, we loved the open communication about everything throughout our build and enjoyed getting our weekly updates with photos of our home progress. Colour selection was one of the funnest parts of this experience, the variety was huge and we loved being able to see what we were choosing in the colour selection office. Great! We met with the supervisor a few times throughout our build and he showed us around our new home and explained everything we were unsure of. Communication throughout the whole construction process was great so we always knew what was going on! We loved how easy the whole process was, and if we had any questions about anything Integrale was great at getting back to us promptly. 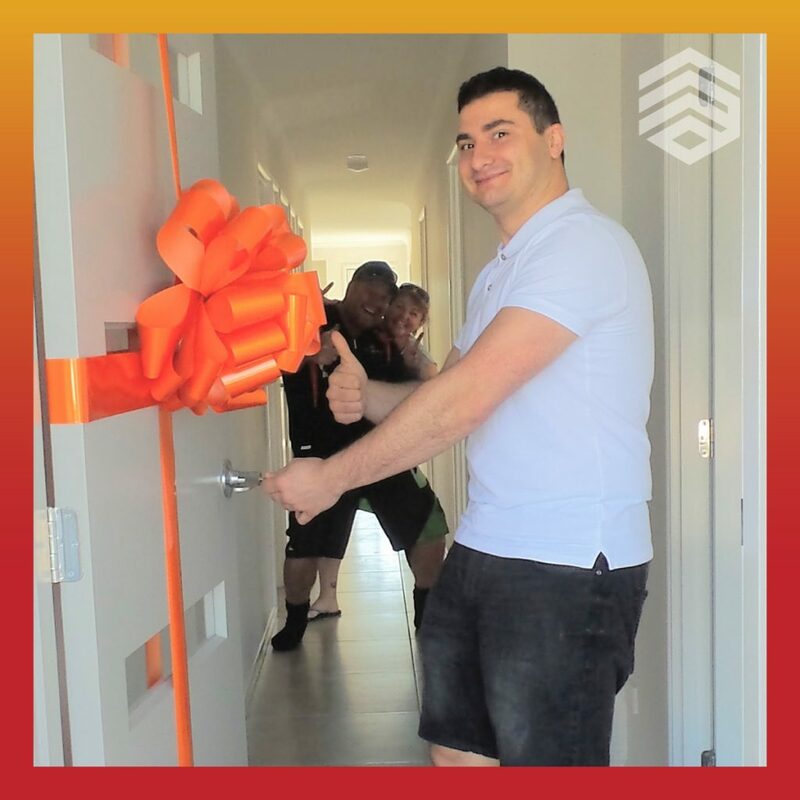 Thank you for making our first build experience so easy and for giving us our perfect home! This was our fourth build with Integrale Homes. Every time the experience gets better and more additions for the same price. The fact that the showroom was local we were able to re-visit a few times, also Naomi (our sales consultant) was pleasant and professional during the sales and development of our plan creating our dream home. We can honestly say that our first building experience has been "amazing". Your team has delivered on everything, big or small, every step of the way. We’ve waited nearly a year to fill out our testimonial form, simply because we wanted to recount on the whole experience, including time after the 6 month building inspection. We can honestly now say, that our first ever building experience has been ‘amazing’. Your team has delivered on everything, big or small, every step of the way. Of course little things/ problems, presented themselves along the way, but it was way in which these problems were handled, is the reason why i would love to build with your team again & why i would not hesitate to recommend Integrale. Thankyou for such a smooth process & pleasant experience & above all, delivering a home we’re proud of. Integrale’s TOTAL PACKAGE upfront fixed price homes and guaranteed build time was perfect for what we were looking for! 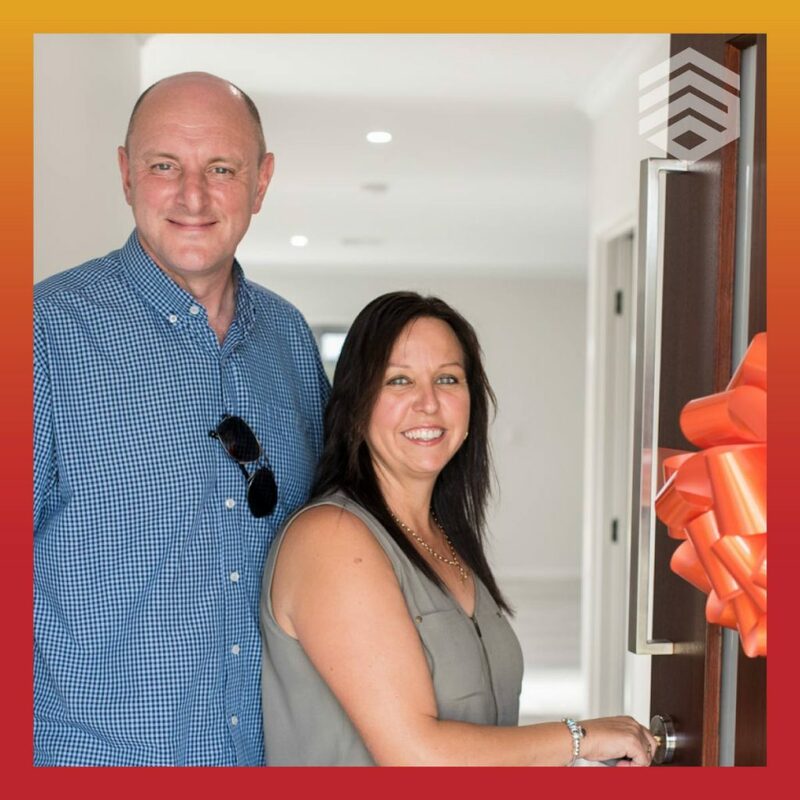 We wanted a ‘no stress’ build and the peace of mind of knowing we’d be able to move in to our home with nothing left to do, so Integrale’s TOTAL PACKAGE upfront fixed price homes and guaranteed build time was perfect for what we were looking for! How did you find your colour selections experience? 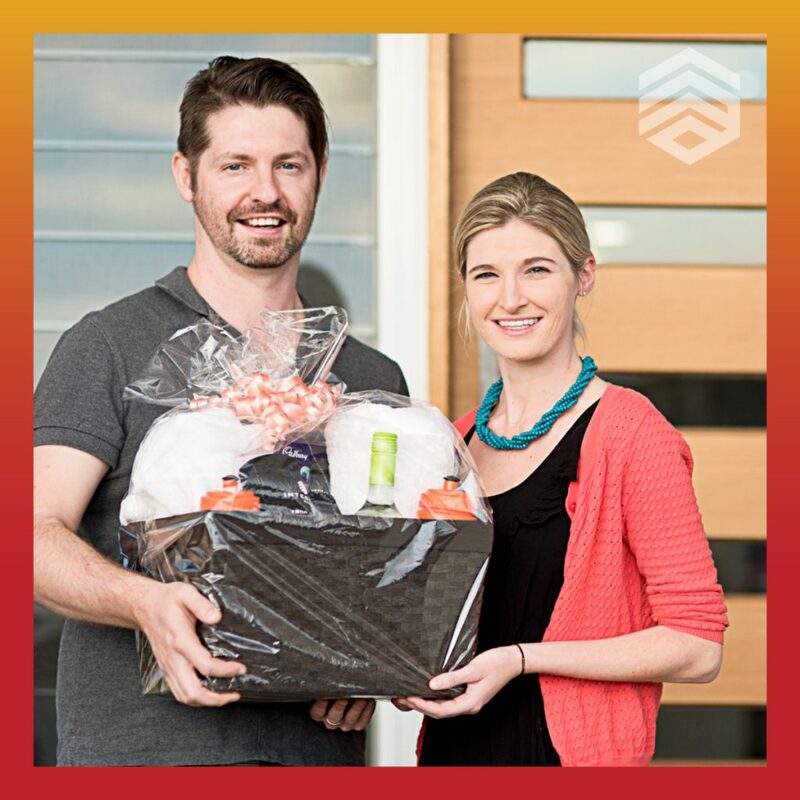 Sarah turned our nerves into excitement and made an initially overwhelming prospect into a fun experience. She listened to our vision and guided us when needed She exceeded our expectations with her assistance! Seamless!! 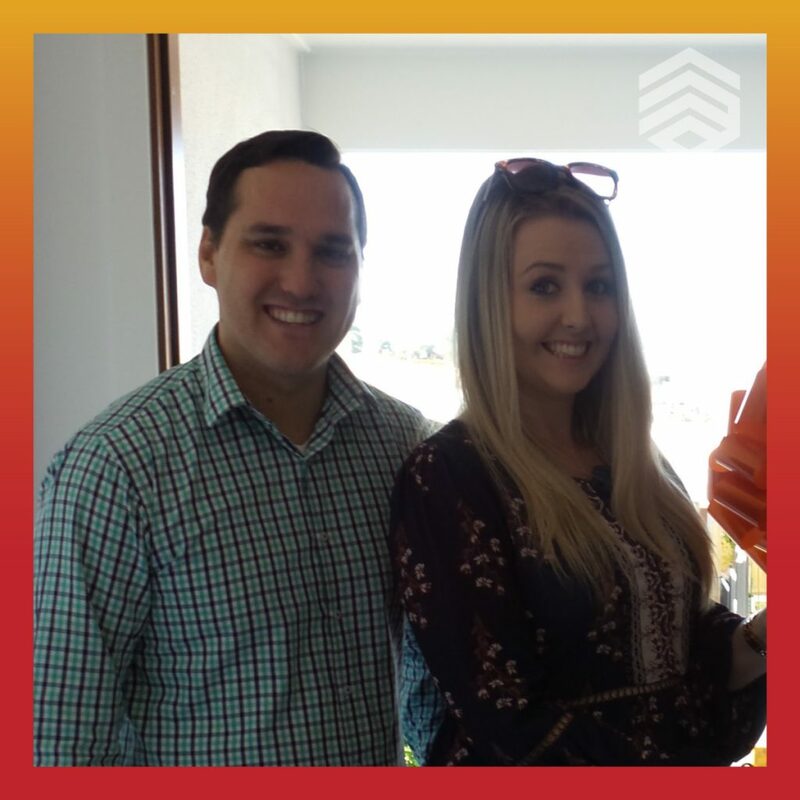 Amy- Lee, Amanda and Troy were efficient and transparent with every step of the process and also very supportive throughout. The feedback/progress reports every week were great and not once were we in the dark or worried about any aspect of the build! Definatley We have nothing but praise!! Just a massive thankyou to everyone involved. We were going through some extremely emotionally strenuous times personally during the whole process and rest assured Integrale took great care of everything while we could tend to our familys grueling time and grieving. We are so happy that Integrale are a part of our first home memories and milestone! Building with Integrale homes was nothing short of an amazing experience. As first home buyers the whole idea of building a new home was very overwhelming until we walked into the display home and spoke to the consultant who put us at ease straight away. 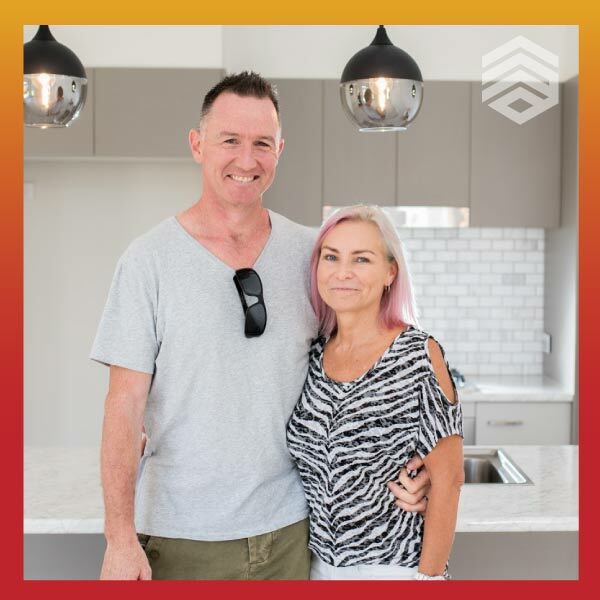 From there the team helped us through the whole process, if it wasn’t for the clever advice from the ladies at the colour stage and the fixed price promise I don’t know if we would’ve had the incredible home that we have today on our modest budget. The main things that caught our eye to choose Integrale were the concepts of “a total home package” we had talked to friends who struggled with neighbours over fences costs and Integrale take care of that for you and even the turf so that when you move in there’s nothing left to do. We were on a tight move time as we were renting so it was great to be in the house on the 18 week deadline which is normally 16 weeks but the team helped us fit a pool into our budget which has always been our dream. We love our home – The open communication with Integrale Homes the whole way through the build kept our minds at ease – I would recommend them to anyone wanting to build a new home. Our site supervisor was always there when we required a meeting with reassurance that everything was going to plan. The building quality is awesome and we love our home. Thank you Integrale Homes – more referrals coming your way for sure. 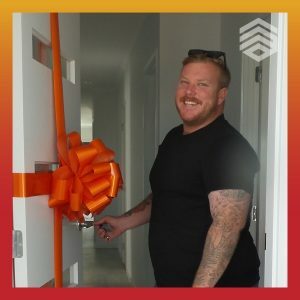 From start to finish everything went very smoothly – from our first meeting with our consultant, to the girls in the office, to the site supervisor, to hand over and 6 month inspection. Everything has been very easy and professional. Integrale Homes were amazing from the first inquiry we made until the handover! Nothing was ever too much trouble, and there was always someone on the end of the phone to answer any questions. Integrale Homes were amazing from the first inquiry we made until the handover! Nothing was ever too much trouble, and there was always someone on the end of the phone to answer any questions. Staff were always very friendly and helpful! The build went smoothly and was on time. We would (and do) recommend Integrale Homes to all of our friends. We have never built before and were a bit nervous but Integrale Homes were fantastic and didn’t let us down! Thank you so much for your fantastic service. We love our new home, it is just how we always imagined it. From the beginning, the whole process was made simple and stress free by the friendly, knowledgeable team. We always looked forward to the weekly updates on a Friday. 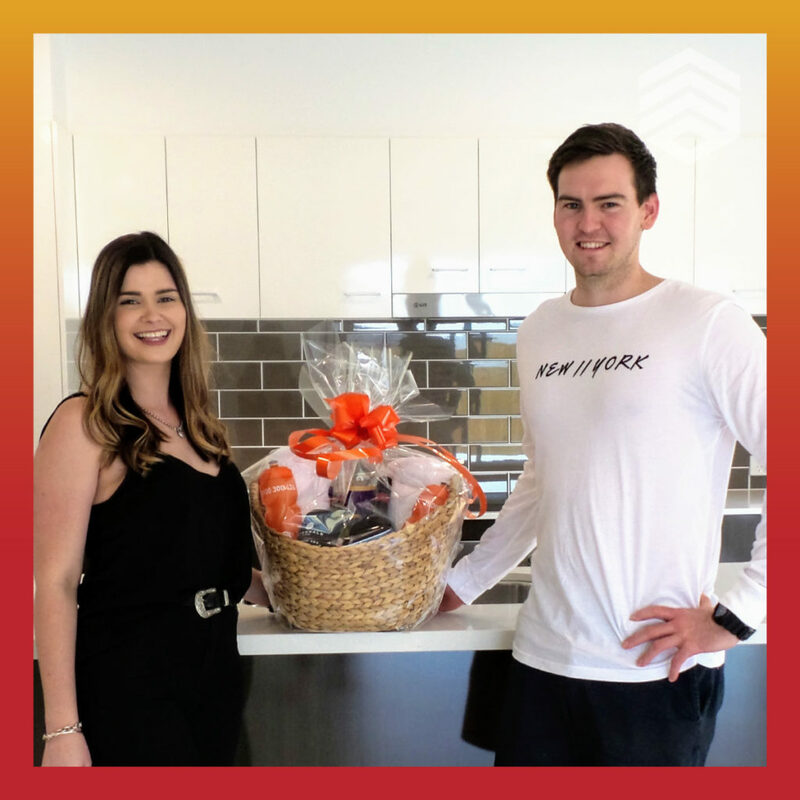 After visiting the display home and speaking to the lovely Integrale Homes consultant, we knew this was the design and builder we wanted to go with. From the beginning, the whole process was made simple and stress free by the friendly, knowledgeable team. We always looked forward to the weekly updates on a Friday. We would like to thank everyone involved in our build. We are thrilled with our new home and would highly recommend Integrale Homes. I had a budget which I needed to stick with and Integrale Homes was the only builder offering the full turn key at the time. I also added in a couple of nice extra inclusions which weren't a problem either. I chose integrale homes because they were the only building company that could offer me a total package at the time. I run my own business and was very time poor during the building process so I needed to know that I could have everything I needed upon moving in. The trades were fantastic and I am so happy with the end result. I had a budget which I needed to stick with and Integrale Homes was the only builder offering the full turn key at the time. I also added in a couple of nice extra inclusions which weren’t a problem either. We would like to say that we are very happy with way that our house has been build. The finishes have been very professional. We have built four times before and know that everything fell into place easily. Everything was built on time. No hassles. Our Supervisor has been very helpful through the build. We would have no hesitation in recommending Integrale Homes to anyone. Thank you. From the first initial meeting we were offered high quality service and provided with everything we needed to know. 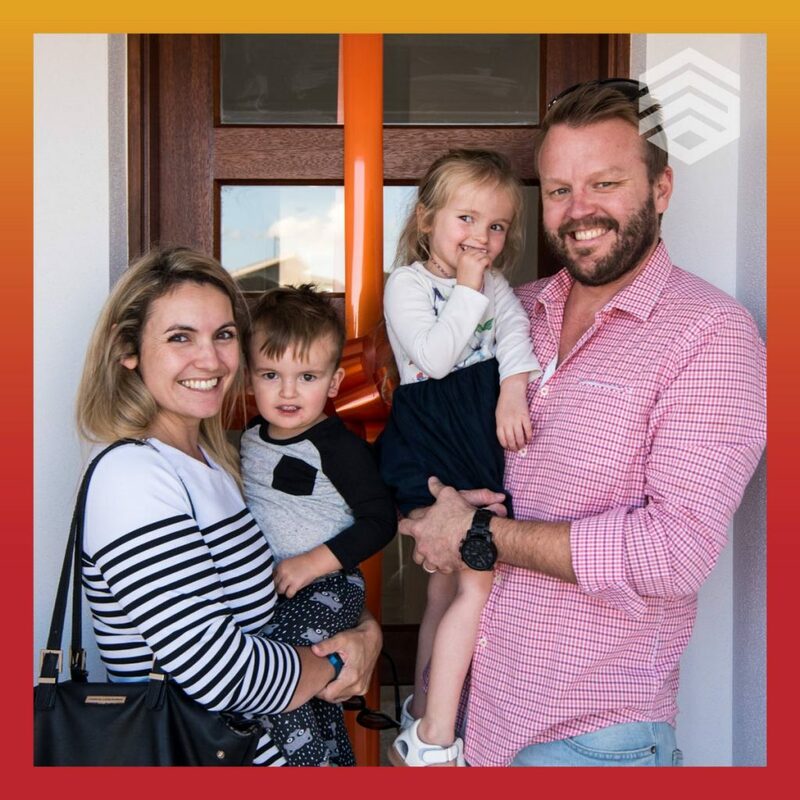 We were sold within an hour and chose Integrale to build our family home. Integrale offered us everything we required including lawn, fences and a covered alfresco at a fixed price. Andrew and I knew exactly what we wanted in our family home and after talking to many builders around the Sunshine Coast we met with the consultant from Integrale. From the first initial meeting we were offered high quality service and provided with everything we needed to know. We were sold within an hour and chose Integrale to build our family home. Integrale offered us everything we required including lawn, fences and a covered alfresco at a fixed price. The entire process was simple and easy as we were guided through the first stage by the consultant who made themselves available to answer questions and meet with us. The building process to us seemed daunting, however Integrale eased this stress and within less than 16 weeks we had a home that we had chosen, had assisted in designing with many choices and options for our high quality inclusions. We have now moved in and we could not be happier. We would highly recommend Integrale to anyone, the staff are helpful and provide step by step progress on what is happening throughout the whole 16 weeks. We are now proud to own our Integrale home! 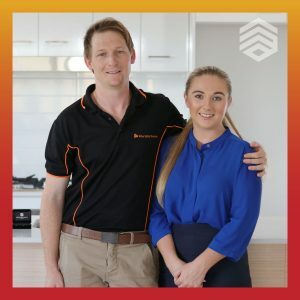 The team are easy to talk to, upfront and genuine people who really wanted to help build our first home. We would definitely recommend building with Integrale Homes. We love our Integrale Home. 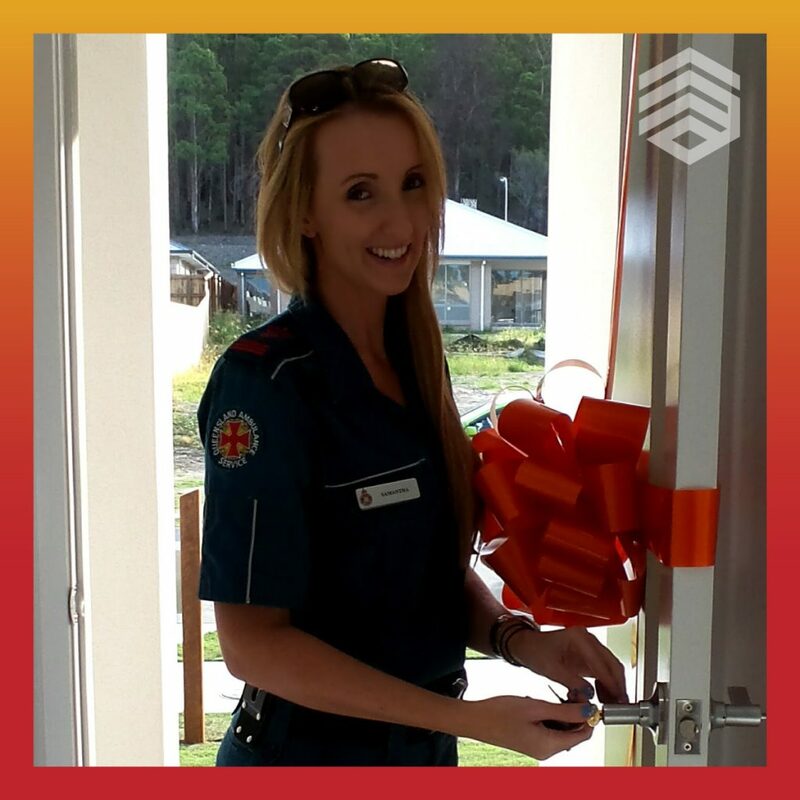 From the time we stepped into the display home till we received our keys at handover the team at Integrale were great. The team are easy to talk to, upfront and genuine people who really wanted to help build our first home. We would definitely recommend building with Integrale Homes. We are thrilled with our new home! The finishes and workmanship is outstanding. We would happily recommend integrale homes - very professional and friendly. We are thrilled with our new home! The finishes and workmanship is outstanding. We would happily recommend integrale homes – very professional and friendly. They also suggested some great ideas for the house along the way. We love our new home!! Thank you to the whole Integrale team.